Daniel Louis "Dan" Castellaneta is an actor, comedian, singer, and television writer who provides the regular voice of the Robot Devil on Futurama, as well as at least one minor character. Outside of Futurama, he is arguably best known to international audiences as the voice of Homer Simpson and numerous other characters (such as Krusty the Clown, Sideshow Mel, Grampa Simpson, Hans Moleman, Groundskeeper Willie, and Mayor "Diamond" Joe Quimby) on The Simpsons, although he has given his voice to other animated characters including Grandpa Phil and the Jolly Olly Man (a bitter, child-hating ice cream truck driver) on Hey Arnold! (alongside fellow Futurama and Simpsons actor Tress MacNeille) and the Genie in the Aladdin TV series. He was previously a member of the improv comedy group The Second City from 1983 to 1987, and has appeared in many live action film and television roles as well. 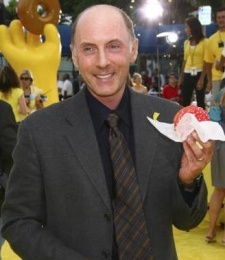 Dan Castellaneta guest-stars in two episodes of season 7 — "The Six Million Dollar Mon" and "Calculon 2.0" —, both of which are episode 7 of their broadcast seasons. This page was last edited on 4 July 2016, at 09:50.